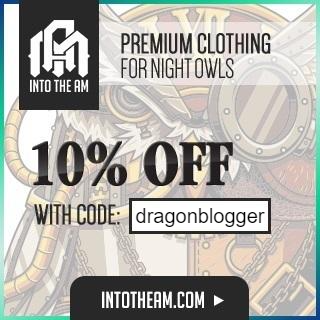 As many people know I run multiple social media accounts and one of the tools I use is Hootsuite to help spread messages across multiple accounts both scheduled via automation and manually. But on March 23rd 2018 Twitter updated it’s terms of service and rules to not allow you to post the same message to multiple Twitter accounts anymore and you can the updated rules on automation and multiple twitter accounts over on the twitter dev blog. Substantially the main changes are apps and users are not allowed to post duplicate are near identical comment to multiple Twitter accounts any longer. They also already updated Tweetdeck with the new rules. Dlvr.it other services are next to follow suite in preventing you from selecting multiple accounts to post the same message. But so if you can’t post the same message, can you create a Twitter account that serves to retweet another account as a proxy? You see a lot of celebrity mirror accounts and other accounts that only serve to share or retweet another famous account in order to find like followers and fans they can connect with. 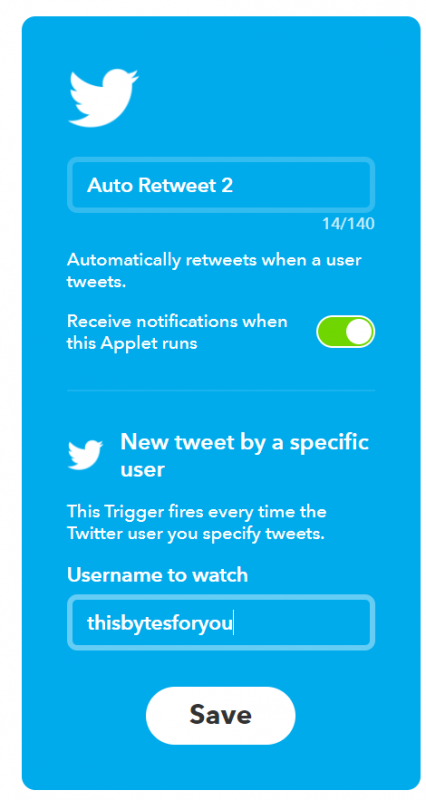 So if you want to automate retweeting another account, then look no further than good old IFTTT (If This Then That) service which is free. Once you register and setup an account with the service, I used the Auto Retweet app and you simply connect your Twitter account to it, then type in which Twitter account you want to retweet. 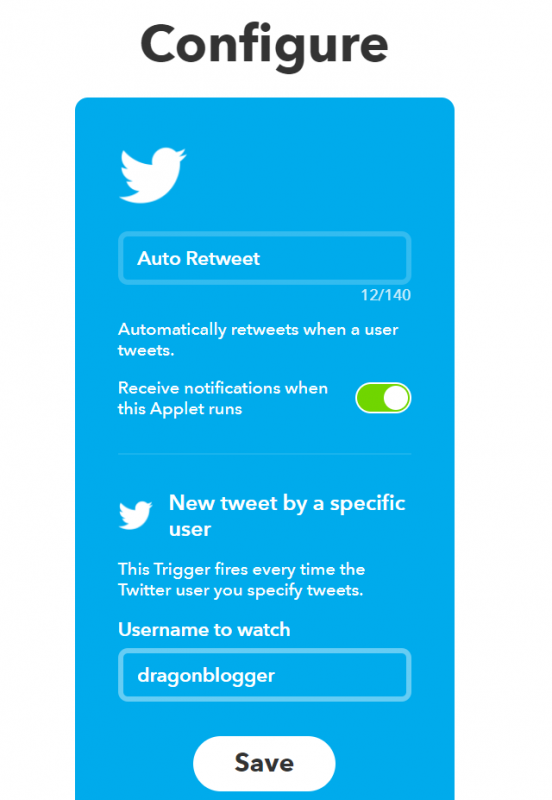 You can also setup multiple versions of the app to retweet multiple Twitter accounts. So once setup you can just validate by watching your feed or when the notices come out. Since this is only using 1 Twitter account I don’t think it violates the new rules, but will update this post if these type of applets are removed. 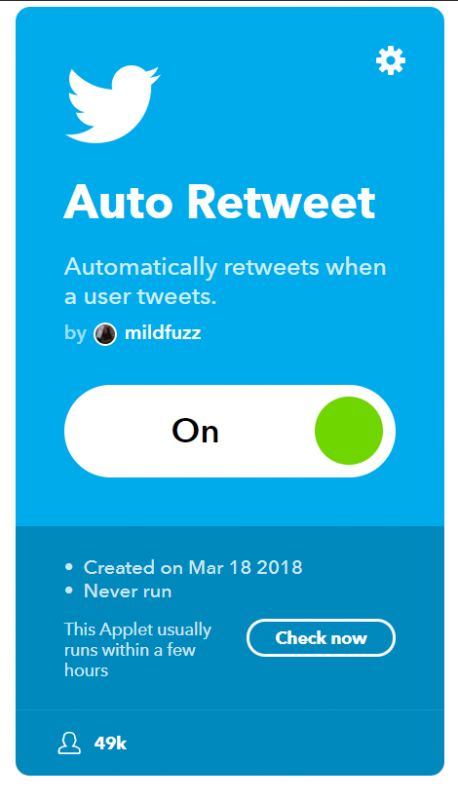 There are multiple applets listed that retweet other accounts, I chose this one because it had a 1:1 mapping of your account to single account to retweet, figuring less multiple user management would less likely lead to terms of service issues. The DragonBloggers twitter account was just the staff version of the DragonBlogger Twitter account that the team can manage and use, but it mostly used to just share the information dragonblogger shared, except if someone wanted to ask one of the writers a question they would do it through the dragonbloggers Twitter account since DragonBlogger is only tied to me.